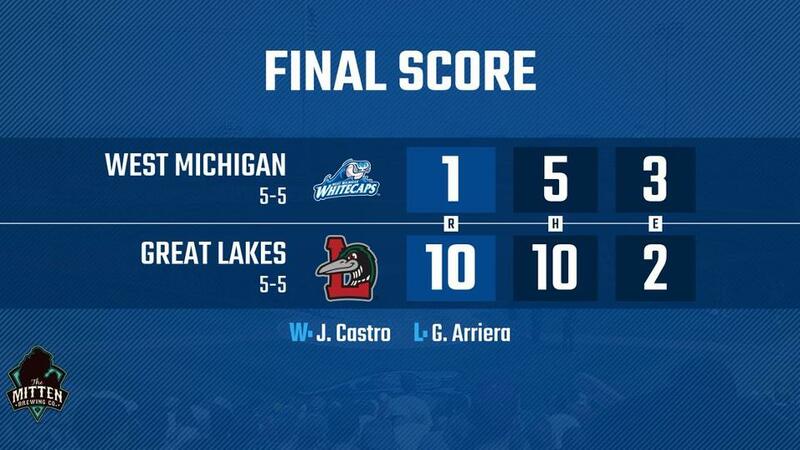 COMSTOCK PARK, MI - West Michigan Whitecaps pitching struggled on the mound, giving up 11 walks and coming up on the short end of a 10-1 loss to the Great Lakes Loons on a windswept, chilly overcast Saturday at Fifth Third Ballpark. The walks total for the Whitecaps represents the most allowed in a regular season game since a twelve-walk performance in a home game vs. Quad Cities on May 5, 2013. Whitecaps righty Gio Arriera gave up four base hits in a two-inning start and was hampered by two 'Caps fielding errors as part of a five-run Great Lakes outburst. The Loons used six walks and three base hits to tally two runs in the fifth and three more in the sixth to take a commanding 10-0 lead. Meanwhile, the West Michigan offense labored against the Loons starter Jeronimo Castro, producing only a Nick Ames double in the fourth inning. Castro tallied four strikeouts and just two walks in five innings. Six relievers followed Arriera for West Michigan, culminating in first baseman Jordan Pearce pitching a scoreless ninth inning and recording a strikeout which thrilled the Fifth Third Ballpark crowd. The Whitecaps managed to scratch out a run in the seventh inning as an Ulrich Bojarski sacrifice fly scored Ames to make the score 10-1. The score would stand as West Michigan fell for the second straight game in the three-game series.